The museum mounts three or four special exhibits per year. Because the exhibits are often on the second floor, where my office is, I get to watch them go up and then study the individual works at my leisure for the two or three months of the exhibit. This winter the exhibit is a collection of materials from the now-defunct Milwaukee Road railroad, on loan from the Milwaukee Public Library’s archives. I love trains and train travel. My nostalgic, romantic view is probably due to the fact that I was born too late to have actually experienced that era’s heyday. A trip by train was no doubt crowded and hot and long. My little Amtrak Hiawatha jaunts to Chicago with my mug of coffee in a spacious seat in an air-conditioned, smooth-riding car—or sometimes in the Empire Builder’s Superliner Lounge Car, which is really nice!—cannot compare with the stress my grandparents and great-grandparents would have felt trying to get from place to place. I remember my mom taking me to see my hometown’s train station being demolished when I was very young. It was replaced by lots of fresh blacktop for parking lots. My mom actually took us to see several old buildings getting torn down when I was young. Urban renewal was in its prime, and she must have thought it important for us to see these structures before they were completely gone—to be a witness to history, I suppose. Maybe that’s where I got my a) love of history and b) strongly felt nostalgia for “ghosts” of abandoned ruins. 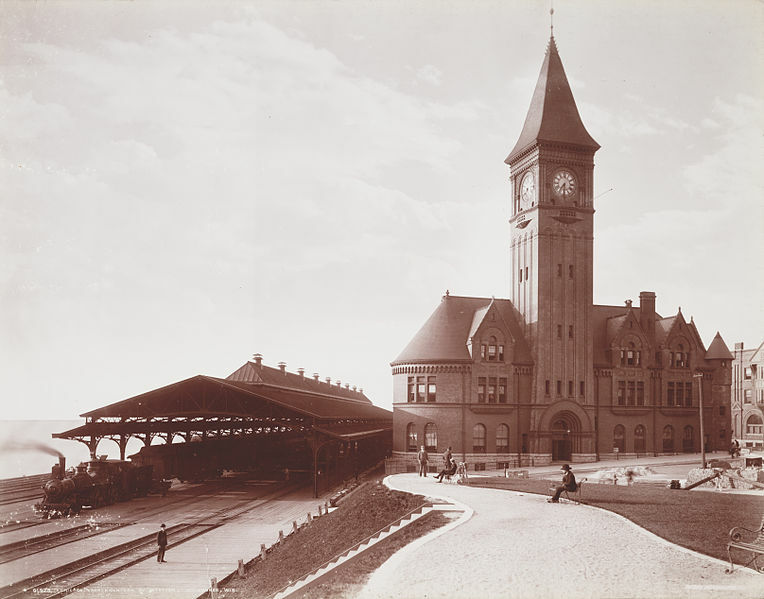 Here in Milwaukee many historic buildings were also demolished during the urban renewal madness, including the Chicago and North Western Railway’s Lake Front Depot train station in 1968. But, anyway, getting to the point of this post😄, there are a couple of thoughts I’ve had in viewing the Milwaukee Road exhibit the last few weeks. 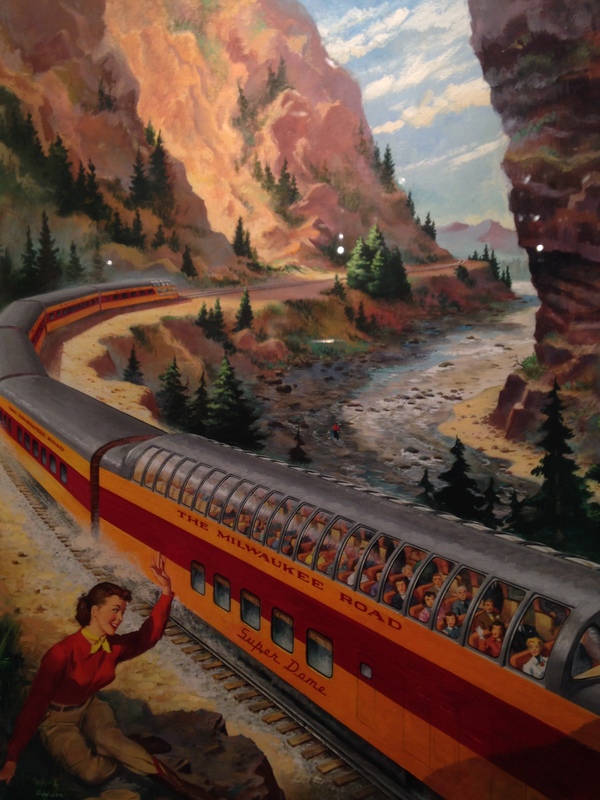 First, a romantic view of train travel was apparently encouraged by the railroads themselves. 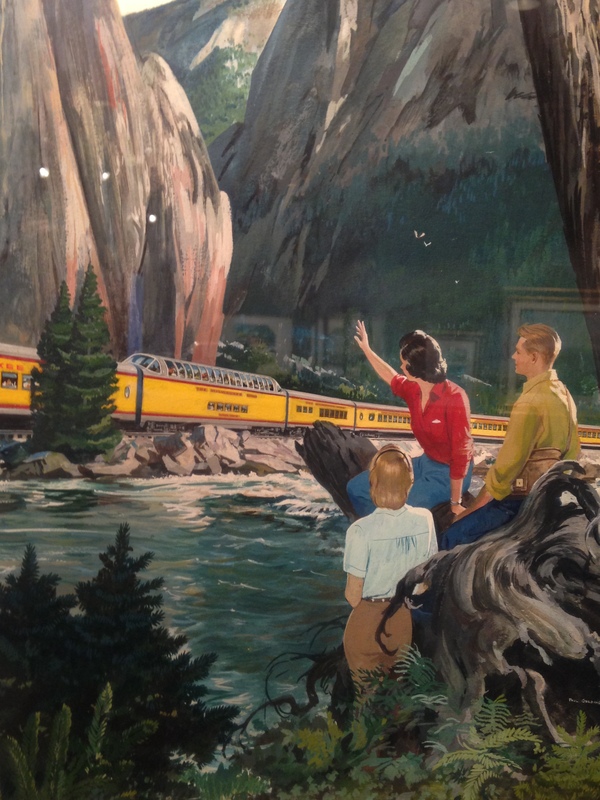 Included in the Milwaukee Road exhibit are advertising materials from the (I’m going to say) 1950s, showing the passenger trains speeding through pristine wilderness landscapes where random attractive young people just happen to be hanging around to wave as the trains pass by. Second, and this is the main thing I have been thinking about: What have we lost? 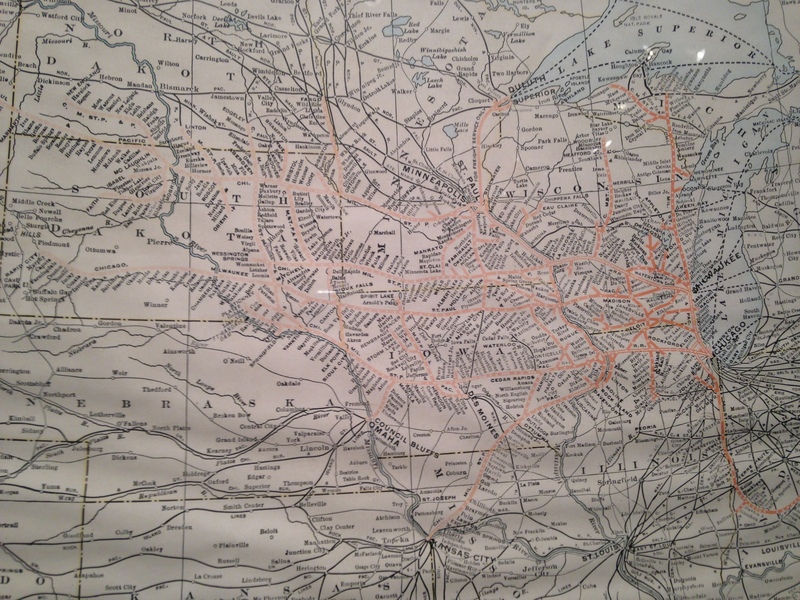 Included in the exhibit is a large map of the Milwaukee Road’s routes. For a big-picture view of the area this railroad used to serve, below is a map of its routes from the Wikipedia article on the Milwaukee Road. All those towns along the routes—the people who lived there were connected to the world! One of my friends is from a small town in South Dakota, and she’s told me that if she flies home to visit instead of driving, her dad has to drive for hours, each way, to pick her up at the airport. If you live in one of these towns today, you have to have a car. Not even the Greyhound bus lines go there. It was “progress” when all the train stations were demolished and railroad tracks abandoned. No one wanted to travel by train anymore, apparently. And it’s true that automobiles give you lots more freedom and flexibility than trains. There’s no turning back the clock. But I have to say, more and more frequently I find myself wishing that trains were a viable alternative to planes (ugh!) and cars for long trips. 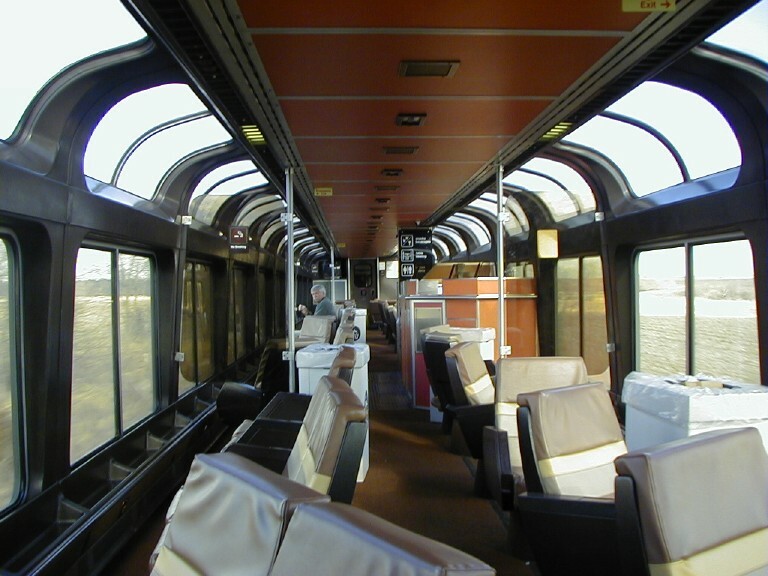 This entry was posted in Art, History, Life, Milwaukee, Popular culture, Technology, Travel and tagged Amtrak, Eckhart Grohmann, Grohmann Museum, Milwaukee Road, Milwaukee School of Engineering, railroads, The Milwaukee Road, train travel, urban renewal. Bookmark the permalink.